I just got this coat...Mum approves! 1) Pack bag: Partially checked! 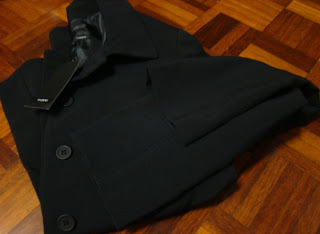 2) Buy a coat that mum approves of: Checked! 4) Renew Passport and Get Visa Application Done: Checked! 5) Get Visa Medical Check Done: Checked! 8) Meet up with as many friends as possible: Getting there! 9) Get a backpack: Checked! 12) Buy Malaysian batik for University International Staff: Checked! 13) Learn a full Malaysian dance: Next week! 14) Sort out accommodation in Canada: Checked! 17) Sew Batik Dress: Checked! 20) Get Immunisations Updated: Checked! 21) Meet Tun Dr Mahathir: Aiseh...Not yet! Besides that, I think I'm not toooo behind on my list...Anybody got anything else to suggest or add to my list? I could use some help...Alot in fact! Thanks! Nice coat! Where did you get it? I'm looking for you too. And you have yourself quite a list there. I'm proud of you! I don't hear of many young people who put on their list traditional costumes and local craft gifts for the university people. why dont u sing bahtera mahkota or something like tht? sorrylah, i pun bad in song names. lol. or maybe just do wht Pi suggested. take a video and post is on ur blog sbb i pun nak tumpang tengok. haha. if i were u, id buy more shoes/sandals, tshirt, summer dresses in Msia. Nice coat Daph! I approve too. Looks like a Padini is it? I've been to Canada dear. Don't bother getting food. The Chinese stores and Chinatown there have more variety than here. They have all the HK & Viet variety too. 22) Continue blogging about preparations and everything that makes you you. Also, get ur folks a webcam n mike for their PC. Here's wishing you all good things in Canada, and go dazzle them with all the traditional costumes you're bringing there with you, and of course - your natural charms, and you'll be more than fine there. hi daphne, u know ur MMR immunization right, we are supposed to actually take it is? i thought just need to write when was the last time i took it... hmmm, i'm so confused la, lol! as for the dance u could learn maybe the mak inang or like boria since those are the easiest. hahaha! so fun! safe trips! oh yea! omg, u know wat would be better? if u like, do batik! its damn simple i tell u, lol. all u really need is the canting and wax. the rest u could even get it in canada i think. haha! oh! or maybe wayang kulit! that'll be cool! Email U Lee of your ETA Canada incase you may need a big car to transfer your luggage to the place you are going to stay. U Lee is big, strong and friendly. Hey where did I steal that tag line from? As for slippers, yeah, that I will! Hi...Thanks for coming over and leaving me your 'prints' here...Always good to meet new friends! But thanks for the suggestions!